Ellie: I would say, Lover of God. Ellie: My heart is drawn to Scotland, and even though I’ve been there multiple times, I’d go again in a heartbeat. Grazing sheep, lochs, the Highlands, the isles, and even remote spittals*—all captured my heart. I met dear friends there—Brian and Isabel—also lovers of God. On my trip, I would simply follow them around to listen and drink in the high-powered nutrition of their spiritual relationship with people and with God. How could I record such an experience? Only a few people are sufficiently gifted for such writings, and I’m not one of them. I could prick a vein and write in blood, but even that would be a weak portrayal. Ellie: My theme would be, “Praise, My Soul, the King of Heaven,” based on Psalm 103. It speaks my heart. Having written a novel on the life of King David (The Stones), I identify with his passionate love for the Lord. Me ‘n David—that’s our song! Great choice. Thanks so much for dropping by! Ellie would love to give away a copy of An Unspeakable Glory, reader’s choice of format. (Print, USA only) Please leave a comment to be entered. A noted gardener from snobbish Westchester County in New York, finds a stranger, obviously ill, sprawled near her delphiniums. She takes him into her house and cares for him an entire week and only later learns who he really is. An investigative reporter uncovers the secret week, and both Linda and her guest become a spectacle in the eyes of the world. Ellie Gustafson began thinking up stories at a young age but didn’t write anything down until much later. After graduating from Wheaton College in Illinois, she jumped into church life as a minister’s wife, teacher, musician, newsletter editor (Asaph by name), and encourager. Additional experiences include gardening, house construction, tree farming, and parenting—all of which helped bring color and humor to her fiction. 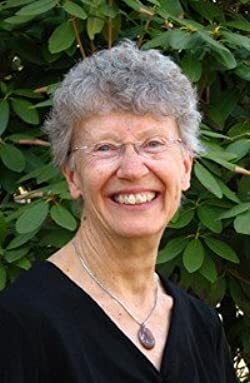 One of her major writing goals has been to make scriptural principles understandable and relevant for today’s readers through the undeniable power of story. Love the theme song for a movie about your life, Ellie Gustafson. That’s a unique way to remember an address! Love it. Thanks, Emily! No, that’s an old hymn dating back to 1834 and written by Henry Lyte. It is based on David’s Psalm 103, and that, too, is one of my favorite psalms. Thanks for liking it, Emily, and for giving me two chances to reply to you!